With apologies to Mel Brooks, perhaps It's not good to be the king? The Burger King, that is. Burger King is facing a big threat from a resurgent McDonald's -- and feuding with Wendy's on social media. 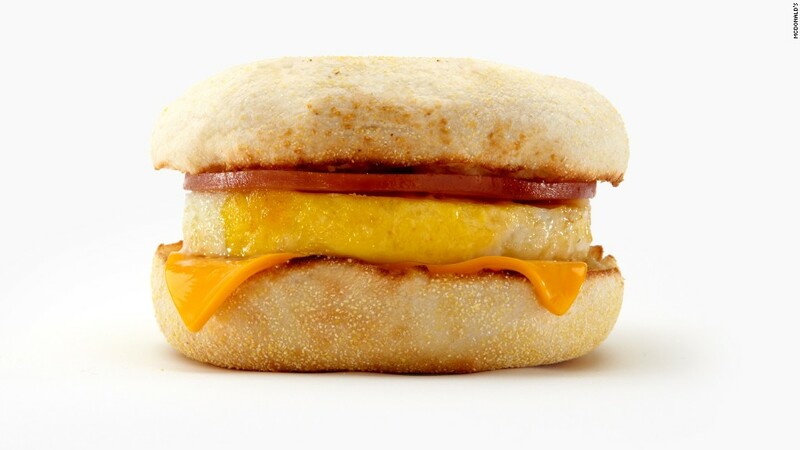 Shares of Mickey D's are up nearly 35% over the past year and sales are surging thanks to all day breakfast and some new menu items. Wendy's (WEN) isn't doing much better. Its stock is down nearly 7% over the past year. All three burger chains are involved in a fast food price war. So far, McDonald's appears to be the only winner. McDonald's (MCD) launched its new McPick $2 menu earlier this year -- a replacement for the old Dollar Menu -- that allows people to buy 2 items for 2 bucks. Executives from Mickey D's said in a conference call with analysts Monday that the promotion is off to a good start. Both of McDonald's key rivals have big deals of their own. Wendy's is offering 4 items for $4. Not to be outdone, Burger King one-upped it with a 5 for $4 deal -- and jabbed Wendy's about it on Twitter last week. Wendy's fought back though. When someone on Twitter asked Wendy's how they planned to respond to Burger King's new offer, Wendy's tweeted that it would let its food do the talking. Ouch! Burger King didn't address the "edible food" remark in the following tweet, but it appeared to be referring to Wendy's here. Never trust anyone who says they don't feel like BK. Still, while Burger King and Wendy's take a page from the Donald Trump school of tweeting, McDonald's has remained above the fray. And it is having the last laugh. Burger King's same-store sales were up 6.2% in the third quarter, but the consensus estimate for the fourth quarter is for growth of just 2.9%. Wall Street is predicting that growth will slow even further this year. Analysts are predicting a same-store sales increase of only 2.2% in the first quarter and 1.8% in the second quarter. Wendy's is expected to report same-store sales growth of 3.2% in the fourth quarter. Meanwhile, McDonald's just reported fourth quarter same-store sales growth of 5.7% in the United States. It just goes to show how quickly fortunes can change in the burger business. Burger King appeared to have all the momentum just 12 months ago. McDonald's was reeling. CEO Don Thompson was ousted in January 2015 after several quarters of lackluster results. Burger King, controlled by Brazilian private equity firm (and friend of Warren Buffett) 3G Capital, was riding high after completing its Tim Hortons merger. Buffett's Berkshire Hathaway (BRKB) even purchased a 4% stake in Restaurant Brands. Burger King was also making waves with Millennials thanks to new products like Buffalo Chicken Fries and Extra Long siracha and jalapeno cheeseburgers. Now the company is stuck trolling the Wendy's Twtitter feed while McDonald's is back on top of the fast food world.